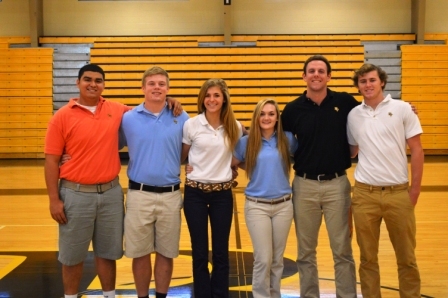 Six standout athletes - four football players and two cheer captains - were selected by Rotary South to participate in the annual Rotary South All Star Football Classic. The game will be held on Wednesday, December 10th at Fort Myers High School. Advance game tickets can be purchased in the football office for $5.00 or purchased at the gate. Congratulations to Marco Garcia, Tommy Dean, Kelly Baker, Lauren Oyer, Quinn Farrell and Weston Cole.